Energy and Resource Solutions, Inc.
Gary Epstein is the President and Founder of ERS and is a US Green Building Council LEED Accredited Professional. His interdisciplinary skills are in the energy engineering and environmental consulting fields. 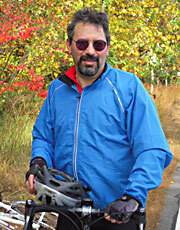 His current work and areas of expertise include energy technology characterization, impact evaluation, research, and assessment; energy code development and consulting; assessment of environmental impacts of energy use and conservation; and development, planning, and evaluation of utility and government resource conservation programs. Gary is the past chair of the AESP Energy Services and Technology Committee and his work has been published in numerous professional journals and conference proceedings. Mr. Epstein holds an MS from the University of Massachusetts and a BS from the State University of New York at Buffalo, both in Mechanical Engineering. You can contact Gary at or 978-521-2550, x225 or gepstein@ers-inc.com.